I was never much of a believer in New Year’s Resolutions. They’re not common in my culture – in China, we traditionally get new clothes for the new year – so I didn’t learn about them until I moved back to the U.S. for high school. From there I watched my peers make them and fail at them, and I thought it was silly to have to wait until a new year to set new goals. Somewhere between then and now, my mentality changed. There’s something clean and refreshing about the very man-made concept of a New Year. Especially now that I am no longer in school and my life no longer revolves around the September-to-June calendar, January 1st can hold a new type of significance for me, instead of the end of Christmas break. While I still don’t subscribe to the behavior of waiting until a new year to set a goal, I have become a believer of new year’s resolutions. It took a few tries – I think I tried on and off for a few years but I didn’t properly record my first one until January 1, 2016. Learn to prioritize small happinesses over small money. Underneath it, I wrote: Treat yourself. Go out. You don’t need to “earn” it. You don’t need it but you can have it if it makes you happy. I tried to unlearn my habit of shaming myself for treating myself, whether it was to a nice meal out or to a dress from a fast-fashion store. While I don’t know if I was fully successful in that goal – I do still feel bad if I spend too much money – I do think I’ve become less miserly. Which is saying something, because most of my friends would say that I’m still pretty frugal. One of the things that really helped with the process was the bullet journal habit I picked up in late 2015. I had been tracking my expenses for some time to help keep me in check when I first started college because I had completely overspent my first semester after gaining the newfound freedom of living in a city instead of the middle of nowhere Connecticut. I think, in fact, that being scared of overspending again – especially after I switched to spending my own money instead of living off of my parents’ for food and nonessentials – helped fuel my miserly self-shaming. I started drawing little doodles with each expense in a calendar layout. Not only did it lessen the pain of spending the money, it also helped me see the patterns around my spending and fueled the idea for the calendar memory-keeping doodles I now do regularly. With the minor success of my first proper resolution, I wanted to try some more this year. 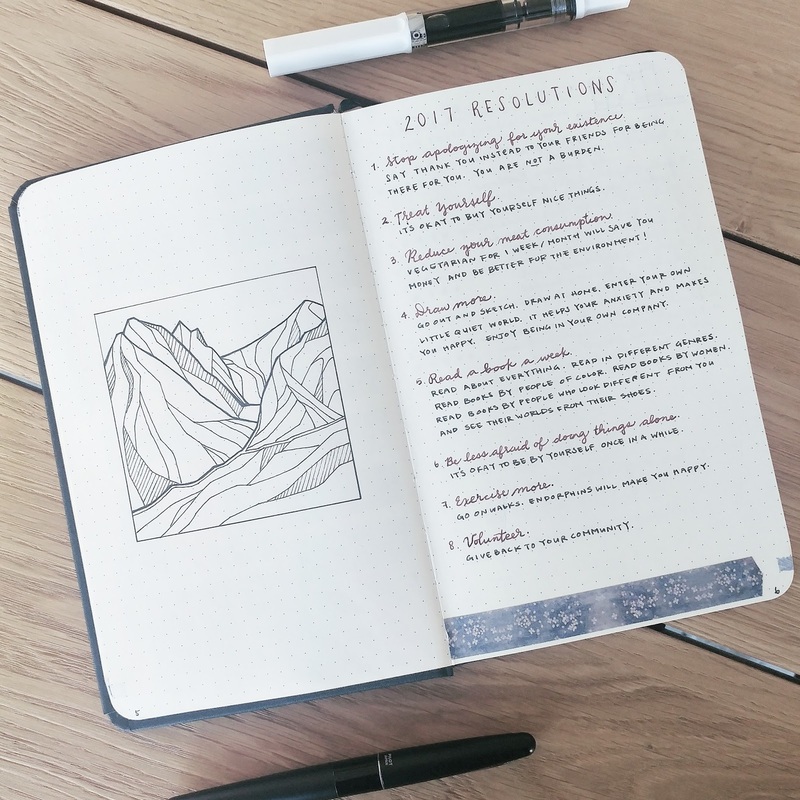 Given that I now had more time to work on myself, I had a more extensive list of resolutions; some easier to achieve than others. Some I had already started the year previous and wanted to continue working on in the following year. Stop apologizing for your existence. One of my bad habits was to apologize to my friends after I had complained to them about something that was stressing me out or after I thought I had spent too long dominating the conversation. They always said apologizing was silly and unnecessary; of course they didn’t mind me talking to them about my problems because they cared about me and wanted me to be happy. I realized that my continuous apologies only fueled my own poor self-perception; the idea that I was a burden to the people around me instead of a person they cared about and wished well. I began to make an effort to say “thank you” instead of “I’m sorry” when I could. I caught myself slipping up a lot in the beginning of the year, but now that it’s been more than half a year, I haven’t noticed myself apologizing for unnecessary things at all. I actually forgot that this was one of my resolutions until I looked back at them today. I do think that I completed this resolution. My perception of myself, while still not stellar, has improved. I’ve become more confident in my place with my friends – obviously their love and affirmations were a huge part in that improvement – and I think that has carried over to other parts of my life. I am less afraid to ask for help at work and more confident in my role as an asset to the company, which I think helps me be a better employee. This is obviously a carry-over resolution from the year before but still something I continue to work on. Treating myself has become easier since I started making a salary with disposable income, but I also think that becoming more confident in myself helps me be more okay with spending money on myself. I’ve become better at not thinking that spending money on myself is a waste – because of course, fueling my happinesses is not wasteful. A joint resolution between my cutie roomie and I, we wanted to take our kind-of-weekly sit down dinners to another level while also being more environmentally friendly. Neither of us are committed to the idea of going fully vegetarian, but reducing meat consumption – especially in a country that consumes meat really excessively – was not only ethically responsible but also a completely achievable goal for us. We decided to go meat-free one week a month for every month of the year, and I’m pleased to say that we’ve been largely successful in that goal. We have had to split a few weeks up into parts because of a variety of reasons, but seven days a month of meat-free meals turns out to be really easy to do. We get to explore recipes that we probably would have otherwise ignored, have a joint Pinterest board for vegetarian recipe ideas, and we trade off on cooking until the food runs out, which is pretty fun! While cooking is one of my greatest joys in life, it’s nice to relinquish cooking duties once in a while. Drawing is one of my ways of finding solace. It’s always been there for me when I was sad, and it helps me find color in a world that can sometimes seem grey. I stopped drawing in college because I didn’t have the time, but I picked it back up after graduating. I wanted to draw more because I knew it made me happier when I wasn’t happy with what was happening in my life.I was posting pictures of my artwork very regularly for a while because I was being prolific in my sketchbook. A few months ago, as I flipped through my sketchbook, I had a bizarre realization that a lot of my drawings felt sad to me. It was because I could remember every emotion I was feeling as I drew those drawings, and a lot of them felt lonely and sad because I had been lonely and sad in my mind when I was working on them. My goal’s been edited a bit since then. While I’m being less prolific, I’m trying to be in a happier mind space when I create my work. I was doing really well with this for a while but I’m a bit behind. 52 books in 52 weeks is pretty difficult, and I fell into a reading rut for a while during the summer. I’ve been able to slowly get back into it with a book about the history of tea, and I have a bunch of books lined up again and ready for consuming. Be less afraid of doing things alone. This resolution goes hand in hand with a Draw more and Volunteer. I have a bad habit of needing company when I explore unfamiliar things, but I’ve become more accustomed to being around just myself. I’ve found that it’s extremely peaceful to sit on the High Line and sketch the space around me while listening to music on a randomly chosen Spotify playlist. Blessed with good genes and an ability to sit still and draw or read for hours, I have never been in my life a person who exercises. I danced for a few years as a child and again in college, but apart from that, I am very much a hermit. My idea of exercising more meant that I should achieve my 10k step goal at least once a week. I have not been doing too poorly at that, so I will consider that a win. I found the organization New York Cares last year when I was trying to think of ideas for things to do in the city, and it’s been pretty rewarding. It took a few tries to find something that I thought fit with my personality, but I did find two recurring projects that I really enjoy: playing with children at the Henry Street Settlement and tutoring adults for high school math equivalency at Opportunities for a Better Tomorrow.I forgot how enjoyable I found tutoring to be until I picked it back up. While the location is really far away – it takes about an hour and a half to get home from the OBT location I tutor at – the gratitude from the people I help and the joy I get from helping people grasp math better is more than worth the trek. I’ve tried to volunteer at least once a month, although some months I’ve done more than one session and some months I haven’t done any depending on my own availability. The tutoring opportunity currently isn’t available but I’m pretty excited for the sessions to start up again.New Year’s Resolutions don’t work for everyone – the extensive amount of articles that come out every January 1st about sticking to them is indicative enough of that fact. However, I think there’s a lot of value to setting some self-improvement goals once in a while and trying to stick to them, and there’s no shame in editing those goals as they change and warp and as you grow. I do think I’m a better person for it. And that’s what resolutions are all about, aren’t they?